Welcome to SCUBA News. If you haven't yet booked your holiday travel insurance then see our suggestions for specialist diving insurance with 5% off. As well as the diving around mainland Portugal, there is also splendid diving in the Azores and Madeira archipelagos which sit way out in the Atlantic. There are many different bodies around the world which award diving qualifications and we've updated our table giving a rough guide to equivalent qualifications. The best diving in Honduras is in the Bay Islands. These comprise Roatan, Utila and Guanaja which are part of the Mesoamerican Barrier Reef. Of these, Utila has the better diving, and has the added advantage of being cheaper than Roatan. April and May are a good time to dive the Bay Isands, when the weather is warm and dry. Several questions this month: please contact news@scubatravel.co.uk with your answers and opinions. I have an HSE1 and a C.S.W.I.P 3.2U (now expired), and I wanted to know if there's a NVQ level for either. I contacted TWI but they don't know. I want to study and it would be most helpful to have a NVQ credit. I have an advanced open water with National Dive League. Is it worth me doing a PADI Open Water advanced? Could you please tell me which of CMAS or PADI certificates is more valid(reputable)? As a instructor with dyslexia I find I'm warmed to my student that also have dyslexia and find I have personally found away to understand and remember dive theory, this also works well with my student because I can teach theory in a way that help dyslexia suffers. So I would say you are right by saying there should find a dive center that is acceptant to slower learners but also would say it's much more about the instructor also. If they can find the right dive shop with the right instructor then there would be a very good chance to help his daughter, providing the center give the instructor the time needed and offers one on one. At the end of the day teaching should be about giving not taking. 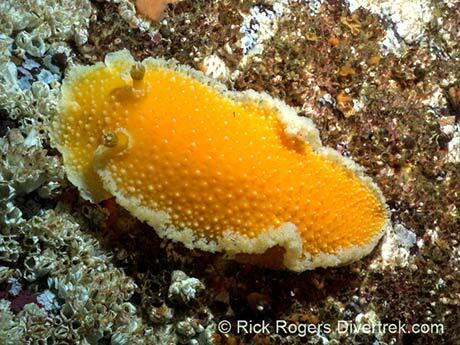 The Orange-Peel Nudibranch (Tochuina tetraquetra) is the largest nudibranch in the world, growing to 50 cm or 18 inches!. You can find them from Siberia to Alaska and down to California. The one in the photo was about 15-20 cm long, and was just inches from my wide angle dome. And they're supposedly edible. The delicate looking lace-like margin comprises its gill tufts and you can also see the two "antennae-like" rhinophores (scent receptors). It feeds on hydroids, sea pens and soft corals. Depending on what it eats, the colour changes from a pale yellow-orange to a deep red-orange. Photographed in the Browning Pass of British Columbia. I tried to light it up in order to accentuate the surface texture. Photographers are invited to submit up to three photos in six categories, including marine life, destinations, human impact and marine conservation. Greenpeace finds suppliers of cod to Birds Eye, Findus and Young's are using controversial bottom trawlers in the northern Barents Sea. Submarine robots can act independently: finding and following squid. Cetaceans are protected worldwide but vulnerable to incidental harm from an expanding array of human activities at sea. Managing potential hazards to these highly-mobile populations increasingly requires a detailed understanding of their seasonal distributions and habitats. In general, the deeper you go in the ocean, the fewer living organisms you find. But during a 4000-metre-deep dive this month, shipboard scientists came across a large aggregation of corals and sponges plus a deep sea shark. For the first time sea level has been mapped from space with GPS reflections. The information could help monitor ocean currents by measuring the slopes currents cause in the ocean's surface.